State Bank of India on Monday invited bids from strategic as well as financial bidders for stake sale in ailing Jet Airways. As per the advertisement, the airline has availed various credit facilities aggregating over Rs 8,000 from a consortium of domestic lenders led by SBI. The company has subsequently come under stress and not been able to service its debt obligations in relation to the facilities. The consortium has proposed to offer at least 3.54 crore shares of the airline comprising 31.2 per cent of equity share capital of the company and up to a maximum of 8.51 crore shares comprising 75 per cent on fully diluted basis subject to approval, it said. "Bidders shall bear all costs associated with the preparation and submission of the EOI. The lenders or authorised representative shall not, under any circumstances be responsible or liable for any such costs in this regard, whether direct, incidental or consequential," it added. It further said that the bidders can be strategic investors (SIs) and/ or financial investors (FIs). "SIs may include body corporates having experience in similar sectors with domestic or global experience or both. FIs may include private equity funds, investment funds etc," it said. SIs should have a minimum three years of experience in commercial aviation business. In the event the bidder is a consortium, it should consist of not more than three members with shareholding of an individual member not being less than 15 per cent and should also have a lead member. 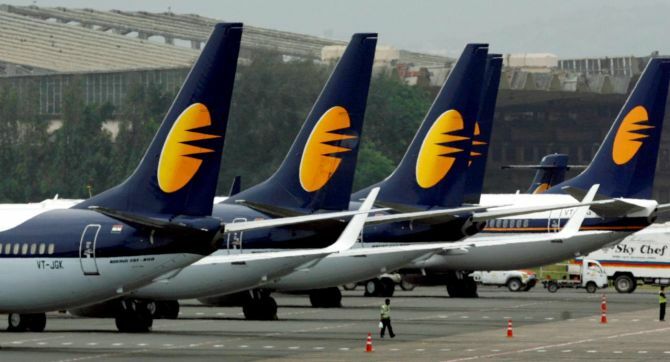 Can Naresh Goyal take back Jet through auction? Death of another Indian airline?